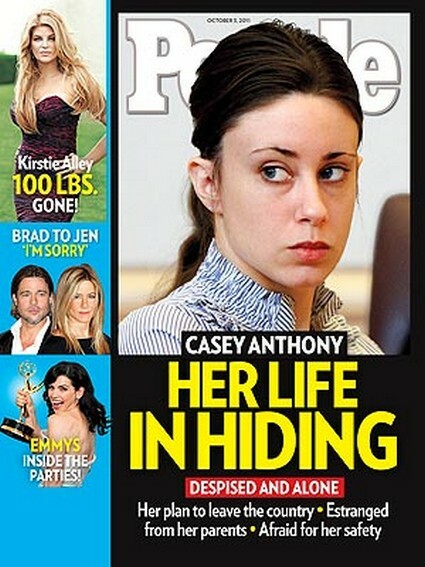 The October 3rd, 2011 issue of People Magazine features murder mom Casey Anthony with the cover story “Casey Anthony: Her Life In Hiding”. The magazine claims they have a source that reveals that since Casey is one of the most if not the most hated women in America she may have to leave the country and is taking language lessons to prepare for her possible departure. Casey who is now living in Florida will finish her probation next year and apparently is afraid for her safety. Many people are outraged by her ‘not guilty’ verdict and Casey fears for her life. She has been receiving hate mail and the magazine suggests even her parents are estranged from her. Boo hoo she has a lot of regrets, all those regrets won’t bring poor Caylee back. This women makes me ill, she deserves to be despised and alone. What do you think? Do you feel sorry for Casey? If you must find out more pick up the current issue of People Magazine!